Jarious enters his second season as the Lions’ offensive coordinator in 2019. He re-joined the club in 2018 after formerly serving as the club’s quarterback’s coach in 2013. The Notre Dame grad and former Denver Broncos draft selection enjoyed a very successful eight-year CFL career, seven seasons of which were spent in a BC Lions uniform from 2005 to 2011. The gifted pivot dressed for 108 regular season games for the Leos recording 499 completions on 919 attempts for 7,032 yards along with 51 touchdowns. Enjoying two Grey Cup titles as a member of the Lions in 2006 and 2011, he would lift the hallowed trophy once more in 2012 as a member of the Toronto Argonauts and also started four games that year. Following his playing days and his retirement as a member of the Lions, the club took advantage of Jarious’ natural mentoring skills, naming him quarterbacks coach in 2013. 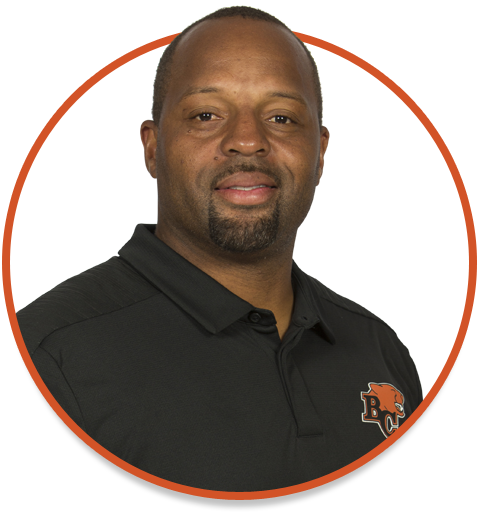 Gaining league-wide recognition as an innovative offensive mind, he was promptly scooped-up and promoted the next season as a member of the Edmonton Eskimos assuming the role of passing game coordinator and quarterbacks coach in 2014. A year later, he was enjoying his fourth Grey Cup playing a key part in the remarkable comeback of injured quarterback Mike Reilly and his MVP performance in the 2015 championship game. Jarious followed head coach Chris Jones to the Saskatchewan Roughriders in 2016 and spent two seasons with the Green and White helping turnaround the team’s performance on offence and coming within one game of another Grey Cup appearance in 2017. Born in Mississippi, Jarious played his collegiate football at Notre Dame where he was a two-year starter and set school records for passing (2,753 yards), attempts (316) and completions (184) during the 1999 season. He was drafted by the Denver Broncos in 2000 and spent four seasons with the club including one year with the Barcelona Dragons of NFL Europe. Jarious and his partner Jaynine have two children and split their off-season time between Vancouver and Houston.